Denver Home Styles - Craftsman Bungalow: Denver Homes & Real Estate - Vintage Homes of Denver, Inc. The Craftsman-style bungalow found a steady following in the Denver real estate market from 1910-1930. The popular Arts and Crafts movement took hold during the Industrial Revolution and called for a more simple and natural home style. Craftsman bungalows display a reverence for natural lines and materials. These homes typically showcase beautiful wood mouldings and trim, a testament to the skilled woodworkers that were busily employed in the first Denver suburbs. 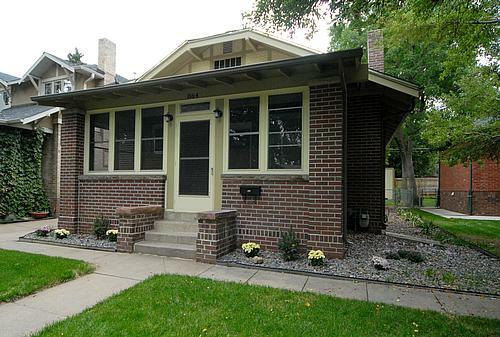 It is the bungalow, in particular, that gives Denver neighborhoods their quaint charm. Bungalows were single story and most often placed on a basement foundation. The layout was precise and did away with Victorian necessities such as parlors and grand entries. They included large front porches to take in daily amounts of sun and fresh air while allowing for large amounts of natural light. The beauty and simplicity of these homes remain attractive to today's home buyer. The Craftsman bungalow style can be found throughout Denver and vary in size from the smallest of cottages to near mansion proportions. They are easily remodeled to mesh with the modern family. In fact, the term "pop-top" is commonly used in the Denver area. It refers to a bungalow that has received a second-story addition. Many home remodeling firms in the Denver area specialize in the seamless integration of these upper stories. If you would like to see available Craftsman bungalows or any other Denver real estate, please contact Vintage Homes of Denver at 303-564-2245.